With an integrated sound system, a space-saving designs, an inclining track and iFit, Proform’s PRO 2000 treadmill is right on the cutting edge of technology. It is ideally suited for use by anyone who weighs under 350 pounds. 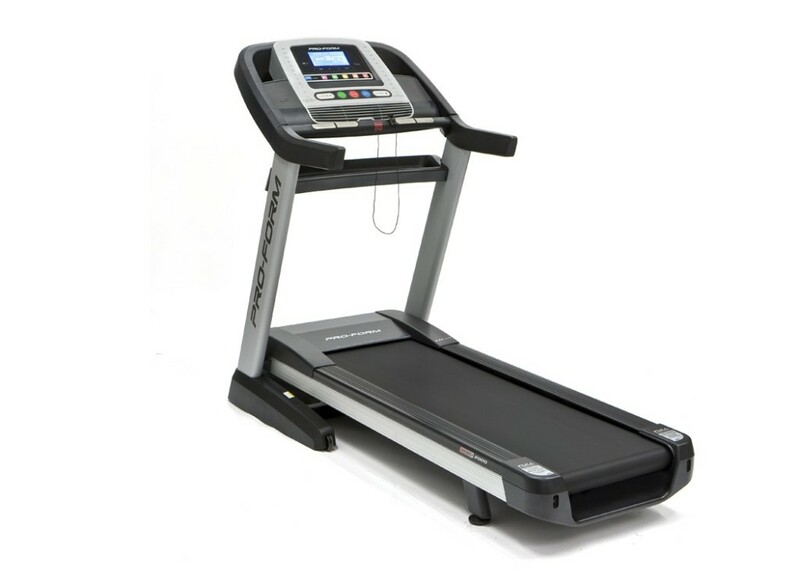 Despite its great features, this treadmill has a surprisingly low price point, being the most affordable of ProForm’s new models. The main difference between this model at the PRO 2500 and PRO 4500 is that it does not have a full-color touch screen and can’t hold quite as much weight. Compact Design: Like all of ProForm’s treadmills, the PRO 2000 folds up when not in use so it doesn’t take up as much room. The process of folding it up is surprisingly easy since it incorporates shock assist technology. Easy-to-Read Display: The treadmill’s 8″ display is easy to see from any height. As a result, finding the perfect workout or tracking your progress throughout your exercise routine is easy. Lots Of Program Choices: The treadmill comes with 24 built-in programs that you can use to create a customized workout. Each program not only offers a different intensity level, but also variations in speed and incline. With so many choices, it is easy to find a workout that is ideally suited for your current level of fitness. Granted, many people overlook the built-in programs and opt for using iFit instead. Once iFit connects to the Internet, it provides acces to countless different workouts. Not only that, but it allows you to interact with others, working virtually with a personal trainer or competing against your friends through social media. Incline Levels: The incline level can be adjusted anywhere between 3% and 15%, making it easy to work a variety of different muscle groups. If you are using a program the incline will automatically adjust. Alternatively, you also have the option to adjust it yourself with the simple press of a button. Music Port: The PRO 2000 has a built-in port that allows you to connect your MP3 player, meaning that you can listen to whatever music you want during your workout. Best of all, the 3.0 Intermix Acoustic speakers provide excellent sound quality. Belt: The treadmill comes equipped with a two-ply belt. Measuring 60″ x 22″, the belt is perfectly sized for just about any body type. Motor: The powerful 3.25 CHP motor, which comes with a lifetime guarantee, can accommodate users who weigh as much as 350 pounds. Warranty: The PRO 2000 comes with a lifetime warranty on the frame of the unit as well as the motor. Other parts are covered by a five-year warranty. It also comes with a two-year service agreement. The Belt: Despite the fact that the PRO 2000 is a top-of-the-line machine, it only comes with a two-ply belt. Although it is guaranteed for five years, it will need to be replaced at some point in the future. A very small percentage of higher-end treadmills come with four-ply belts that are covered by a lifetime guarantee. Length of the Track: At 60″, the track is a fairly typical length for a treadmill. Unfortunately, however, for runners who are extremely tall, it may be too short to accommodate their stride length. Tall individuals may need to opt for something more like the EVO 1 from Smooth, which has a 62″ track length. Overall this is a fantastic treadmill. Despite the fact that it doesn’t have the full-color touch screen display that the other models in the series come equipped with, it still has plenty of other desirable features including an extensive set of built-in programs, a comfortable track, a strong motor and the ability to play your music. Overall our rating for the PRO 2000 is 5 stars.